There are plenty of reasons to hold a banquet. Banquets, for hundreds of years, have been a traditional way for large groups of people to celebrate a specific event, and that’s not something that’s going away anytime soon. 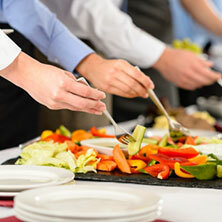 Unfortunately, as many reasons as there are to host a banquet, there is an equal number of ways to mess one up. A banquet is an elegant event for a more civilized age — you don’t want to ruin it by making mistakes that could easily be prevented. There’s one thing that separates a banquet from a mere dinner party — the promise of a high-quality, three-course meal for every single guest. And for that to happen, you need to make sure you have an accurate count of guests. There will inevitably be guests who fall through with any event, but the point is that, if your guest count is off, it’s better to have a deficit than a surplus. 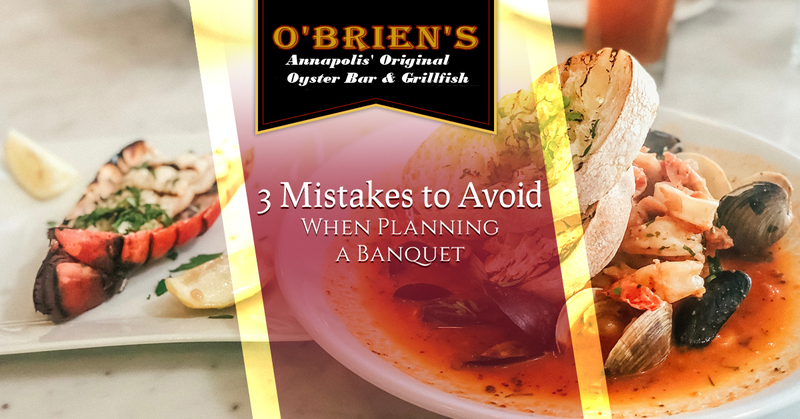 At O’Briens, we make sure that we prepare each and every banquet dish to perfection. This is why we ask for an exact guest count three days in advance, with entree and dessert options specified. By not having to do any guesswork, this leaves us free to put our heart into every single meal, providing an incredible seafood dish to everyone in attendance. Whether it’s fried oysters, delicious crab cakes, or encrusted Mahi Mahi, your guests won’t forget their meal anytime soon. However, if you choose to hold your banquet somewhere else where they don’t enforce an RSVP rule and neither do you, you could have a nasty situation where you either end up with guests who don’t eat, or a situation where you’re compromising on food quality to feed a dubious amount of people. While it seems obvious that going with bad food for a banquet would be a mistake, it’s still worth mentioning! Any good banquet is defined by its food. There are, of course, many great perks to attending a banquet, such as having fun dressing up, enjoying a night out with a date, reveling in the company of friends and family, and celebrating a large event. But ask yourself — what, of these things, couldn’t be done at any other kind of event? Indeed, the defining feature of a banquet, the one that sets it apart from every other type of event, is the food. So, if your guests come in and end up eating mediocre food, you can bet a lot of them will sit there wishing that it was just a normal party instead where they could feel more free to get up and mingle. When good food is served, it’s the cherry on top of a wonderful night. When bad food is served, the night will feel like a missed opportunity for most folks. This is why you should seek out only the best when you’re looking for a banquet venue in Annapolis. As a Maryland native, you likely know how incredible seafood tastes when it’s locally sourced, and you can bet that all our dishes meet that criteria, providing fresh meals that are sure to make tastebuds sing. One of the most important aspects of a well-hosted banquet is, by far, the venue. After all, the venue is what will remain in the forefront of their memories, aside from the food. An event venue forms the atmosphere and mood of the entire event, and if it falls short, it’s easy to feel underwhelmed. When people hear “banquet,” it evokes an expectation of classy sophistication. If the venue in question ends up being a plain rectangular room with weird teal carpets and taupe colored walls with no decorations, you can expect that it’s going to be underwhelming. The good news is that this a problem you need not worry about if you book your banquet dinner with O’Brien’s. 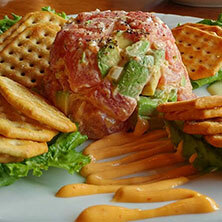 Sitting on Main Street, our restaurant is in one of the most historic regions of Annapolis. 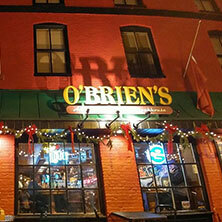 O’Briens has been around since the 1970s — that’s almost 50 years! However, that’s just our restaurant. Our actual property, 113 Main Street, existed long before O’Briens moved in, dating all the way back to 1774! That’s right, when you hold a banquet in our establishment, you’ll have the satisfaction of eating in a building that’s steeped with over 200 years of history. 113 Main Street existed before the Declaration of Independence was signed. It’s been home to a pizza pie parlor and a cabaret theatre, and is even said to be haunted! No matter which way you look at it, it’s harder to find a banquet venue that has a richer history and atmosphere than O’Brien’s. Are you ready to host the most memorable banquet of your life? 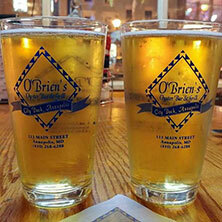 If you’re in Annapolis or any of the surrounding regions, there’s no better choice than O’Brien’s. Getting started is easy — simply contact us today and we can work with you to get the gears turning. We hope to see you soon!